Click here for an interview with Mr. Tzvi Aldroti. Official Neo-Tzig's opinion of yesteryear! if this Sheepshead gets it, there maybe hope for pumpkin heads too. So I thought than, but hey what can you expect of a true blue Goat! 1) Tzaddikim are G-dly people, but unlike Him, they may err, and perhaps even err foolishly and often. 3) Yiddishkeit is all gray, with small black & white areas. 4) The common interpretation of Ahavas Yisroel is ridiculous, impossible and unhealthy. Let's redefine it to mean "respect and deal fairly with your fellow Jew." It's all about "group think" today. Truth is irrelevant and despised – on a group level – and while many individuals may indeed seek it, they are discouraged and insulted if the dare expose that to others. Troublingly, it seems, however, that open-mindedness does generally lead to less frumkeit, while the more restrictive, regimented, and legislated Judaism being sold by the establishment does have a considerably higher rate of success (and if you don't believe me, just look at pre-war Hungarian Yiddishkeit vs. the Polish/Russian model!). Ugh." According to the article the Lubavitcher Rebbe tried to do everything to encourage a healthy chinuch system (no co-ed) Jewish edu in Israel Sad to see now and possibly room for another discussion on this forum that Vaad Hayeshivot Tomchei Tmimim have sold the yeshiva as a yeshivat hesder. With all bochrim belonging to the 4 main yeshivot gedolot being forced to sign and join the IDF after Kvutza. They are actively sponsoring and encouraging a situation that will result in a weakened chinuch system that is already not all that strong. Alot done and decided behind the scenes. This issue seems to me to be far more important and needs to be reported and addressed openly ASAP. 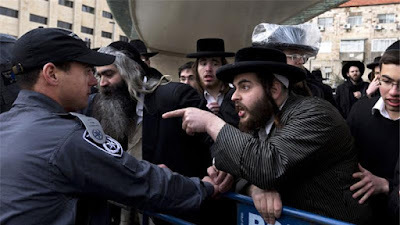 "Protesting about a problem doesn't - necessarily - mean you care (Guest Post)"
GP, SR was the dean the rav"d in the Eida Haceridus of Yerushlium, (not from williamsburg) why should he not care what's going on in the city of god, His city!? The LR protested from afar the ZIM steamship company, for the same reasons cheridum don't fly EL-AL Airlines today! was his protesting (boycotting) from afar ok? I think that we can all agree that the two main events in the Jewish world of the past century were the Holocaust and the establishment of the State of Israel. These two cataclysmic events changed the present Jewish society radically if not even permanently. Yet much of Orthodoxy inexplicably ignores these two events as though they never happened. An entire talented and vital society is doomed to live in the imagined past and disregard present realities. And if the view of the present is unfortunately shaped by historical and social disconnect and denial then certainly the longer and equally vitally important view of the future will be distorted and skewed. Sooner or later, reality must sink in and when it does the pain, anger and frustration over past distortions and failures will become very difficult to bear. The great struggle of most of Orthodoxy in the nineteenth and early twentieth centuries against Zionism influenced all Orthodox thought and behavior. As late as 1937, with German Jewry already prostrate before Hitler's madness and Germany already threatening Poland, the mainstream Orthodox rabbinate in Poland publicly objected to the formation of a Jewish state in the Land of Israel on the grounds that the heads of that state would undoubtedly be secular if not even anti-religious. They were correct in that assessment but, since the Holocaust was then an unimaginable event in their worldview, they continued in their opposition to Jews leaving Poland to settle either in the United States or in Israel. Because of this past mindset, the Holocaust is more unsettling – theologically, at least,to Orthodoxy - than perhaps to any other group in the Jewish world. Much of Orthodoxy chooses to ignore the issue or to contrive very lame excuses and causes for this catastrophe. In my opinion, there is no human answer to the event itself but the event cannot be ignored. One of the consequences of confronting it is naturally an admission that great and holy men can be wrong in their assessment of current events and future occurrences. Much of Orthodoxy is so hagiographic about its present and past leaders that it cannot bring itself to admit that. As such, the past cannot truly help to assess the present. A false past is almost as dangerous as having no past at all. Dealing with the State of Israel is an even more vexing issue for much of Orthodoxy. The creation of the Jewish state, mainly by secular and nonobservant Jews, and by political and military means was not part of the traditional Jewish view of how the Land of Israel would again fall under Jewish rule. Since it occurred in the “wrong” way and was being led by the “wrong” people it again shook the mindset of much of Orthodoxy. One of the great and holy leaders of Orthodox society in Israel stated in 1950 that the state could not last more than fifteen years. Well, it is obvious that in that assessment he was mistaken. But again it is too painful to admit that he was mistaken and therefore the whole attitude of much of the Orthodox world is one of denial of the present fact that the state exists, prospers and is the largest supporter of Torah and Jewish traditional religious lifestyle in the world. It is again too painful to admit that our past mindset regarding the State of Israel is no longer relevant. As long as large sections of Orthodoxy continue to live in an imaginary past and deny the realities of the present, such issues as army or national service, core curriculums of essential general knowledge for all religious schools, entering the workforce and decreasing the debilitating poverty and dysfunction of so many families, will never be able to be addressed properly. The solutions are difficult and they cannot be dictated or legislated no matter how popular such steps may appear to be. But the change of mindset to the present must certainly and eventually occur. The Jewish people have always been up to this task and I am confident that we will be able to do so now as well. I'm writing this as an eye witness. One shabat in the 60's I happen to daven in the satmar shul on Bedford ave. after shacrut the SR left the shul for like an half our, while he was out 100's of people with their talis and shtreimels on left the shul and walked two blocks down on Bedford ave. "Protesting" in front of the YMCH which was catering mostly than to assimilated jews at the time and they had mixed swimming there than, on the same block there where 3 shuls, Square rebbes, young israel, and across was Tzelimer shul, I was told that these 3 where most disturbed by the Y people "hanging" on the streets there in front of the shul people. The good rabbi is proselytizing, to my knowledge it is all refutable therefore no footnotes provided, and no fact checkers needed. HT: "just look at pre-war Hungarian Yiddishkeit vs. the Polish/Russian model!). Ugh." "The Brownsville section of Brooklyn is so Jewish that in the local courthouse you’ll find a clerk who speaks a beautiful Yiddish. In the police station there’s a Jewish captain who also speaks good Yiddish. And what neighborhood sends a socialist assemblyman to Albany? Brownsville. There’s even a Hasidic rebbe, over whose front door is written, “This is God’s gate through which the pious enter.” To be sure, there’s a rebbe. In his dirty apartment, there is a large ark containing a Torah. A woman who said she was his rebbetzin was also there. apparently he has no Hasidim, so other than a few kids the place was empty. At one point, his gabbai, or warden, trundled in and asked if he could write me a kvitl, a query or a problem I have that the rebbe could solve. “Do you want children?” he asked. “Maybe you want to get married, or maybe you have some illness? Do you suffer from headaches or heart problems? Maybe you’re just not feeling well.” The list went on and on. And the rebbe, well, he never showed up." -Forevts 100 Years Ago . יפיפותה של יפת באהלי שם, רק באלקי אומן ישבעו! Rabbi Berel Wein's Rap sheet, he received semicha from Hebrew Theological College, which was founded by his maternal grandfather. a member of the Hapoel Hamizrachi, has a Bachelor's degree and a law degree, practiced as an attorney general in Chicago, accepted the pulpit of Beth Israel Congregation in Miami Beach, became a VP in the OU. In his early years he learned by reb mendel kaplan a disciple of Rabbi "Elchanan Wasserman", and by "Rabbi Chaim Kreiswirth" !!! Rabbi Wein shame on you! You should know better. HT: "they write in the new foreword of על הגאולה ועל התמורה he poshut got sick from it"
כתקדים להפרדה בין בנים לבנות במוסדות החינוך. וכך להוכיח שההפרדה תורמת לשיפור ההישגים. Zionisim as all Isim's is destined to die just like bundism, communism, yiddishism, diaspora nationalism, socialism, trade unionism, and territorialism, bundism, communism, yiddishism, zionism, diaspora nationalism, socialism, trade unionism, and territorialism. True Torah Jews never will die! Perhaps when True Torah Jews will stop feeding the hand that bites them (no more OU corn flakes kugel) The OU Propaganda machine and their entourage of hired fabricated gedolim will be destined to the dust bin of history soon too. RBW: "The solutions are difficult and they cannot be dictated or legislated no matter how popular such steps may appear to be. But the change of mindset to the present must certainly and eventually occur". Guest: "Obviously the Rebbe got nowhere"
Write an article in the next Der Veker about this. They are happy to publish anything of intellectual content. "Reb Moshe did not consider himself a talmid of RYH, as per his family." Did RMS not consider himself a talmid of RYH the same way that RYH did not consider himself a talmid of Rav Kook? Becasue RYH was very clearly a talmid of Rav Kook, and a close one too, at one point in his life. Taking one look at Sefer Pachad Yitzchok and one can see Rav Kook's influence, style and pen. But later on in his life RYH chose a different derech, broke ties with the Kooknicks, had the picture of Rav Kook that hung in his sukka for many years removed, and even once said "I did not learn from him". Or, did RMS just not consider himself a talmid in the traditional sense. Again, hard to imagine, as RMS attended the maamorim of RYH, learned with him bechavrusa, and was influenced by his derech in machshava. Even later in his life, long after the passing of RYH, RMS kept close toes the chasan dbei nesiah and master of machshava RYD and paid visits to the Chaim Berliner Rosh Yeshiva when he was in NY. HT: "The Satmars are famous (or infamous) for their protests to fix Israel's ills"
Satmar never attempted to fix any of Israel's ill's. They attempting to convey a message (thru protesting and otherwise) to the world that Zionisim in any form, has no ligaments to talk in the name of Worldwide Jews, in spreading that point they do succeed. This preacher like rabbi has no theological, statistical or any other proffering attempt to base his accusations on or his false alarmist conclusions on. In a country where at least 47% live with government support, the rest get free schooling, college programs, scholarships, libraries, parks, work incentives, non restricted access to the work place, on and on, (they take their "due" entitlements, the orthodox take theirs, although not enough! I say, each have its legally available ones). 14% of US adults can't read, 19% high school graduates can't read, compare this to the Orthodox population of the Jews as a whole it will be minute in numbers, why shine lights of false theatrics on them only! with alarmist passion comprised of anti race and religion rhetoric, on an peaceful prosperous ethnic group. Is it a crime to live in clusters of ethnic or religion in America? Is it a crime for the poor to have lots of kids in America! (when the White population is rapidly declining) In Europe government child support is an entitlement to the rich and poor equally. The phenomenal success story of the ultra orthodox in America hasn't even begin to be written, for lack of any other appropriate word I would call it the Satmar Revolution, out of the ashes the ultra orthodox have build an orthodoxy that became a beacon to worldwide Orthodox Jews, It's Made in America! They have build open but insulated top notch phenomenal institutions, they inspire towns cities and metropolises inhabitant with integrated ultra orthodox Jews, Take Brooklyn! below minimums crimes reported in their communities, they drive real estate and other markets in the city, (the mayor of NY said, they are the Spirit of the city,) they received minimal support, financial or otherwise, from anyone including the MO jews ! while doing it, according to Pew most households have at least one bread winner, they work hard intuitively and earn as much as the average American household, just like latins or other minorities or religious families in the country they rejoice in large family's, (which renders them poor, by family/household) The US Government encourages "families" to have kids, and certainly not asking you to refrain of, hey are entitled to get graciously government support, and why not? Aren't y'all!? In Europe hate was propagated against Orthodox Jew's before WWII by the half assimilated Jews and to saw hate on them, it may have been a ploy by the ha'shomer ha'tzoer.. for cynical reasons, But in America why saw paranoia, fake news and false prophecy's on them? Who is gaining.. Think. BY: "Protesting about a problem doesn't - necessarily - mean you care"
No denial that he noshed from the RY ZATZAL. He got from so many people. Yet, I assume he did not consider himself a talmid b/c they both got from each other. If you are a CBer, which I suspect you are, you should not feel threatened by Reb Moshe's scope and breadth. GT: "the Leader of the 11211 community got nowhere either"
An Israeli government committee gave an initial nod today Sunday,for the export of medical marijuana in what could be a windfall for companies in Israel, widely regarded as a leader in research in the field. Rabbi Wein's I had a Dream! In the words of an old Dane "Prediction is hazardous, especially about the future" . RBW Civilizations and Empires,cultures and ideologies disappeared, in our time the "almighty" USSR withered and fractured miraculously with out one shot! whole new countries came up over nite, country's come and go! Not so True Torah Jews, If the Hitler era learned you anything? They are here to stay!!! I would add "last but not the least!" right across the street of the infamous "Y" YMCH, was the famous Bardiever rebbes shul of Bedford Ave.! ht: "which was - in my humble opinion - just a ploy"
Achtung! This is not a Ploy! It's REAL! BTW in MHO the connection between the pools in Williamsburg and Yerushalayim does not exist the same way any normal person would not ask why satmar does not protest the thousands of cars driving down Bedford Avenue and all the open stores, unlike Yerushalayim, and if you don't understand the difference then there is no use in trying to explain. ", in spreading that point they do succeed. " how do you rate success? does the government of Azerbaijan, know about the Natronoai group ???? "עדה החרדית, דושינסקי, תורה ויראה, נטורי קרתא, תולדות אהרן, כולל שומרי החומות, בית לפליטות,"
But not to the "zionist parties", who offers them even more money than Ziggy right? Not to venture as far out as Azerbaijan, it's obvious that the "point" reached you alright, and from RBW monolithic monologue the "point" reached him too. iFuratzu this..
Harold Gribbitz, Spring Valley NY Sunday, February 05, 2017: "Wein's I had a Dream!moment, bla..bla..bla"